Start mining for some huge prizes with Bonanza, the latest Barbados online casino game which is unique from other online slot machines and will keep you on your toes as you play! With exciting features such as free spins, fun creative symbols and a huge jackpot to win, you’ll never be bored when you play Bonanza! Furthermore, the RTP for this slot game is a high one at 96%! Big Time Gaming are an experienced game developer for the online casino industry who were established in 2011. Since then they have developed an extensive track record of high quality games which are enjoyed by players all around the world. The team working at Big Time Gaming have over 30 years of experience in the online gaming sector, and they pride themselves on being leaders and innovators in their field. Based in Sydney, Australia, Big Time Gaming specialise in online slot machine games for the online gaming industry, with game available in over 20 languages, which include Russian, Chinese and Japanese. They consistently deliver high-quality games and always aim for customer satisfaction. And many more, click here to play! This game sets itself apart from other slot games as it has a structure of 6 reels. Each of these reels can be filled by up to 7 symbols which are of differing sizes and can cover from 1 to 3 spaces. Combinations of 3 or more matching symbols will result in a win. You can bet from as little as 0.20 per spin or as much as 20.00 per spin. There are lower and higher value symbols which can give you winning combos. The lower value symbols include the playing cards from 9 to Ace, and the higher value symbols include the gems which are in differing shapes and colours. The Wild symbol in this game is the Cart filled with Dynamite, and this symbol can only be found on the special row at the top of the screen. This symbol will act as a substitute for all other regular symbols on the reels and will help you get even more winning combos! The Scatter symbols in this game are the Bars of Gold which carry differed letters, G, O, L and D. When you get all 4 of them on one spin, it will trigger a Free Spins bonus round. · Free Spins: 12 free spins will start when you get at least 4 Scatter symbols in the main game. Each additional Scatter that appears on that spin will reward you with 5 extra free spins! During the Free Spins bonus feature, a win multiplier will increase by 1 each time a winning combination happens. An extra symbol will be added to the top row of the reels and the cart filled with gold bars. When 3 of these carts appear simultaneously, 5 more spins will be added. If you get 4 carts then you will get 10 extra free spins! · Carts: Just above the main screen, you will see a special row which has 4 spaces. During each spin, 4 carts will appear which will be carrying different symbols. They will contribute to any combinations which are made on the main screen. Only Wilds can appear in these carts. 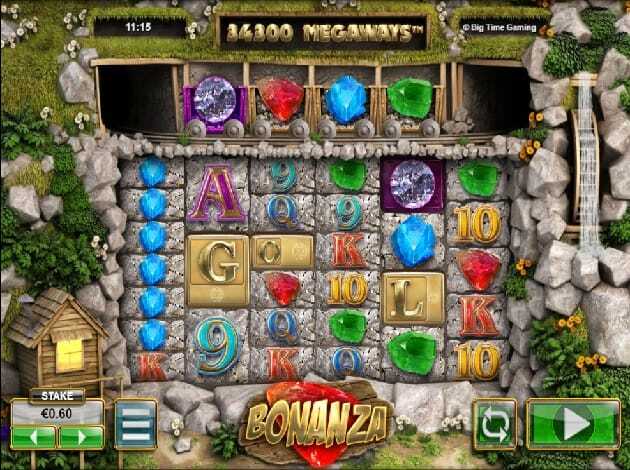 There is so much fun to dig up and you could win some real gems when you play Bonanza. So don’t miss out on the chance to win big, start playing today with this slot online games! 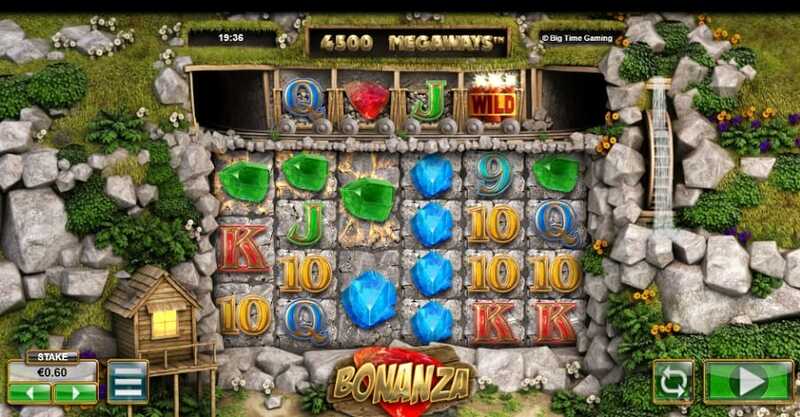 If you enjoyed Bonanza why not try Mega Moolah slot game?